This one-of-a kind home has a beautiful elevation. Its landscaped entrance is only the beginning. 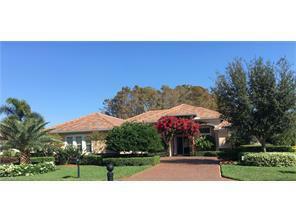 It is situated between two 18 hole championship golf courses in The Verandah Golf and Country Club. In addition you have tennis, nine miles of biking and walking trails, kayaking and a dog park for man’s best friend. It has a fenced yard. The flow of this home is very open to the large lanai that can accommodate even the biggest get togethers. Other features include: alarm system with video camera, complete outdoor kitchen with grill and refrigerator, spacious three car garage and in ground sprinkler system.This Lennar home has it all; open Living room, Great room, 13’ ft. ceilings, all of which overlook the pool and views of the water and preserve. The large kitchen opens up to the family room and lanai which is perfectly placed for complete privacy. The master bedroom has large closets, bath with dual sinks plus walk in shower and tub. Interior features: Stainless steel appliances and granite counter tops. Natural gas water heater, pool heater, spa and cook top make for great energy efficiency. There are crown moldings, walk in closets, and tile throughout (excluding bedrooms).